So what can we possibly say about this little ditty? Clocking in at about 45s it is probably the shortest of all Art Fact tracks. As you know by now, we were really inspired by Depeche Mode, and just like them we wanted to have some shorter instrumental tracks between the regular pop songs. I’m not sure, but I think this track was mainly created using the Roland S-330 sampler. Jonas’ brother Johan bought this for a considerable amount of money from a (then rather unknown) Swedish musician called Wille Craaford. During this period his backing band was called Pondus (I think he was doing some sort of Bruce Springsteen-like music, and wanted his own E Street Band), and we had lots of disks with “Pondus” written on them. Later, Craaford would change style and was a part of Sweden’s answer to Beastie Boys: Just D.
At the time, the S-330 was really impressive. Although not as cool as the Akai S1000, it still was 16 bit 12 bit (sorry!) 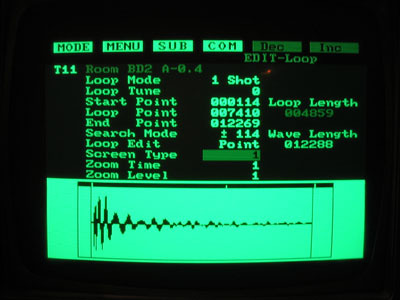 and also ran its own editor in a green glowing monochrome monitor. With this and Opcode Vision running on a Macintosh, we probably had better equipment than the median Swedish synth band at the time. And what did we make of it? 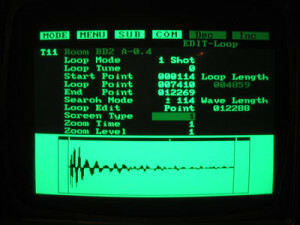 A loop with three samples!